This is the second of a two-part article. Part One is here. Yesterday, I examined the Star Wars fan, trying to assess how their love of Lucas' space opera colors their relations with, and place in, the world. Today, I'm assessing its counterpart, the subject of much debate, the franchise your grandparents confuse it with: Star Trek. 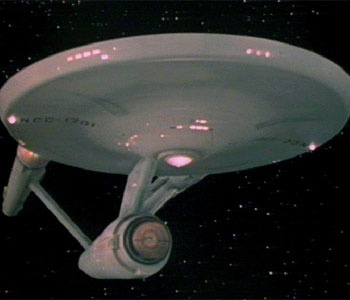 Star Trek began life as a television show, an episodic story that aired, at least in the US, Thursday nights on NBC. It was smart, forward thinking, and awfully unpopular; during its original television run, it failed to capture a sizable audience, and was canceled after three seasons. Even as it foundered, though, it laid the foundation for a legacy of media and a legion of fans, both centered around one central precept: Change. Change is at the heart of Star Trek's success and resonates with those who self-identify as Trekkies. Yes, Star Trek takes place in the future, but it also mines both comedy and pathos by time-traveling to our "present" to highlight how far we can go. Even in the enlightened world of the Federation, though, where beings of all races, species, creeds, work together in pursuit of common goals, there is room for change. We see it in the allegorical addressing of topical social issues, the use of good ol' dramatic irony, and in the highly episodic nature of the television show. That's the reason it's hard to discuss Star Trek's overarching plot. Everything is always changing. That's how I would sum up the entire franchise, if asked. Starfleet is always in the picture, and the framework of the universe stays the same. The Cardassians are always going to be sort of creepy, the Klingons will seem cranky, and the Borg aren't going to stop assimilating anytime soon. Outside of its necessary constructs, though, everything changes, just as in real life. Hopefully it's for the better, sometimes for the worse, but always. Far from looking inside oneself, the Star Trek far looks for the change in the world. They want to push, they want to know more. It's all right there, in the first words of the first introduction of the first series: "to explore strange new worlds; to seek out new life and new civilizations; to boldly go where no man has gone before." For all that Star Wars features in depth of mythology, Star Trek schools them in breadth of scope. Societal change is just one aspect of that core precept, but it's huge, and the one that most people seem to remember. The Original Series is known for airing episodes examining nationalism, racism, sexism, and genocide, "safely" couched in science-fiction settings. Famously, TOS also featured television's first scripted interracial kiss. The Next Generation began to explore, albeit tentatively, society's view of the GLBT community, and scripted an episode responding to the AIDS crisis. Sadly, this episode was never produced. (Enterprise would be the first televised Star Trek property to allegorically address AIDS and its surrounding stigma.) This is not to say that Star Trek has always been on the forefront of social change, or that those responsible for the production of the series and movies have never failed to address a societal issue head-on; there have been some glaring missteps. This doesn't change the fact that the Star Trek fan looks for ripples of change, and watch as they become great, crashing waves. They encourage change in society, and support expanding acceptance. With the itch to change and explore comes the responsibility to, well, be responsible. The Prime Directive defines this as not colonizing everyone or blowing stuff up with abandon, though the Articles of the Federation define it in much more diplomatic terms: "As the right of each sentient species to live in accordance with its normal cultural evolution is considered sacred, no Starfleet personnel may interfere with the normal and healthy development of alien life and culture..." etc. A broader understanding of this credo can be used to understand how a Trekkie relates to the world. Listen to others; broaden your cultural horizons; don't assume that everything you know is right. That veers a little from the "We Know Best" ideology underpinning the Prime Directive, but at the heart, it's still the same message of inclusiveness. There is room for everyone in the universe, and the Star Trek fan understands that better than anyone. Star Trek may have taken many different forms by now, but they're all thematically tied. The concept at the heart of Star Trek is basic enough to transcend every medium, every cast, every crazy situation, and every forbidding planet. While Star Wars promotes internal reflection and understanding, Star Trek explodes its thinking into society at large. With a sense of openmindedness and the understanding that teamwork is the way to go (unless you're wearing red), the Trekkie has the power to change the world. If you're a Star Trek fan, you probably love to learn and are excited by change. You appreciate diversity, and strive to be empathetic. You know that "teamwork makes the dream work." I'm on your team, Star Trek fan. Let's see what's out there.